The Kingdom Tower ... central core at Level 13 and wing walls now at Level Six. THE world’s tallest tower is now in the making, with the first 13 levels of the 170-storey skyscraper now clearly visible above the horizon in Jeddah, Saudi Arabia. 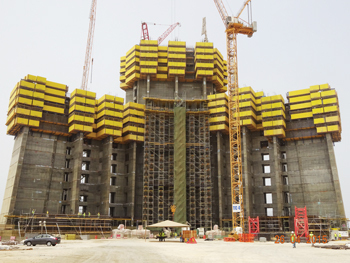 The Kingdom Tower – which is expected to soar to a height of more than 1,000 m – is currently at Level 13 in terms of the central core, with the wing walls now at Level Six, a spokesman for Jeddah Economic Company (JEC), tells Gulf Construction. Work is also in progress on installing the horizontal slabs at Level One, which brings the structural sequence in line with the plan of separation between elements, he adds. Meanwhile, a number of works are being carried out simultaneously on- and off-site. This includes preparation of the reinforcing steel for the structure, the steel coupling beams, and the cladding panels. Also, the vertical transportation motors and equipment and the mechanical and electrical plant and equipment are being procured and readied to coincide with their installation schedule. “We have also accelerated the construction of the Level Seven and Eight slabs, which will complement the crane strategy and allow access to climb the internal tower cranes and create a safe environment for crane collar access,” he says. The SR4.6-billion ($1.22 billion) Kingdom Tower is being built over an area of 85,000 sq m as the centrepiece of the first phase of the Kingdom City, which covers 1.5 million sq m and will comprise 5.3 million sq m of multi-purpose buildings including the tower, a mall, a large mosque for 12,000 worshippers, and other residential and commercial buildings. The tower is designed by architect Adrian Smith and Gordon Gill Architecture. Dar Al Handasah is the project’s construction supervisor, while the EC Harris-Mace JV is managing the project. A number of cutting-edge technologies are being introduced on the Kingdom Tower. Kone, a global leader in elevators and escalators, will deliver the world’s fastest and highest double-decker elevators to the skyscraper. The tower will be equipped with a total of 65 Kone elevators and escalators including 21 Kone MonoSpace elevators, 29 Kone MiniSpace elevators, seven Kone DoubleDeck MiniSpace elevators and eight Kone TravelMaster 110 escalators. 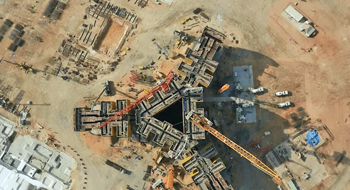 An overhead view of the central core and wing walls. The Kone DoubleDeck MiniSpace elevators will utilise what is described as “revolutionary” Kone UltraRope hoisting technology. “Perhaps the most advanced materials are the Kone UltraRope, a carbon fibre-based ribbon which takes the place of traditional steel rope. This considerably reduces weight which, in turn, reduces the motor size. This gives an obvious benefit to electrical consumption and allows for a greater overall lift height. The UltraRope system also gives a significant benefit to maintenance as the system lasts nearly double the time of steel ropes and will not need to be changed for up to 15 years,” the spokesman says. With safety and durability being of essence on the project, a key initiative has been implemented to ensure the sustainability of the soaring structure. “During the construction of the tower, a detailed structural health monitoring programme is being implemented,” he explains. “This programme measures the characteristics of the concrete and allows the team to monitor and confirm the structure is acting as it should during construction. An example of this is structural shortening, which means as the building grows and more weight is loaded, the concrete actually compresses. This has got to be continually monitored with precise measuring equipment. Any slight deviations from the assumed movement can then be corrected during the following concrete pours. “In this regard, precise tools and instruments are continuously used to measure the building’s vertical and lateral deviations and corrective actions will be taken, if required, to keep the tolerance within limits. The project is approximately six to seven per cent through its progress schedule, which includes the installation of a total of 270 bored piles that sit under the raft foundation of the super skyscraper. Currently, a team of approximately 1,300 workers, including a growing management team, are on site. The construction fleet has also grown to include six tower cranes, 13 construction hoists, nine beneficial use lifts and an expansive mobilisation area, which will be home to the materials supply and storage as well as supply chain offices. The world’s tallest and biggest custom-made cranes are being used to construct the massive structure. JEC has acquired six cranes from German companies Liebherr and WolffKran, which are built to withstand harsh conditions, especially the wind loads that they will be subjected to. The ‘climbing’ cranes are designed to accompany the tower’s growth both externally and internally – in the latter case utilising any of the building’s 65 interior elevator shafts to make the climb. Erecting the world tallest tower undoubtedly throws up complex and sometimes unprecedented challenges. The construction team on the project, however, is trying to stay well ahead of the game in anticipating and planning for some of these challenges. 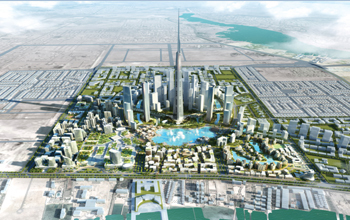 The Kingdom Tower will be the centrepiece of Kingdom City. The main challenge with a building such as this, notes the spokesman, is the logistics and the movement of men and materials. “The temporary systems in place and planned to deliver both men and materials to the tower have been in the planning for a considerable period of time and will become a key factor in an efficient and safe delivery phase of the project. Another key challenge will be the elements. “Cranes and hoists may only be operated up to certain wind speeds which, if exceeded, means the equipment must be shutdown to maintain safety on site. To combat this, we have developed a strategy that includes internal hoists and beneficial use lifts. These lifts are the permanent equipment with a temporary car that allows people movement to continue during inclement weather. “To allow us to predict future conditions, we have engaged a specialist consultant who is forecasting and recording wind speeds and direction at 100-m intervals up to 1,000 m. This innovation will allow the project to forecast crane downtime in the future and, where needed, methodologies may change,” he says. Once the building is enclosed and fit-out commences, people and material movements again become a major factor. To counter this, the team has developed a satellite facility strategy that will allow the workforce to spend all day within their work zone, which will be fitted out with temporary facilities such as a canteen, ablution and prayer rooms. This strategy will enhance worker efficiency and thus maximise productivity to achieve a demanding programme. Some of the notable milestones expected to be achieved this year include the commencement of major trades following on from the structure such as the mechanical, electrical and plumbing (MEP) services, cladding and vertical transportation. The Kingdom Tower features 170 storeys – seven of which will be allocated for the five-star Four Seasons hotel offering 200 rooms, 11 storeys for 121 luxury serviced apartments, and seven storeys for offices. The tower will also have 61 storeys that include 318 housing units of various types, along with amenities that include gyms, spas, cafes and restaurants, two sky lobbies and world’s highest observation decks, located at a height of 644 m, enabling visitors to view the city of Jeddah and the Red Sea from high in the sky. A further double-height eight full refuge floors that are fire resistant will be allocated throughout the tower. The skyscraper will feature a sky terrace – roughly 30 m in diameter – at level 157, which will be an outdoor amenity space intended for use by the penthouse floor.